For those of you who never owned a Sega Genesis, I offer my sincere condolences. You probably never had the opportunity to play one of the best video games of all time...ToeJam & Earl. I'm not even sure how popular this game was outside of the people I knew growing up, but I know that it was one of the most unique games ever made. It was released in 1991, fresh out of the cosmic black hole known as the 80's. While the 80's spawned the video game culture of today, it was also responsible for some of the worst music ever created by humans. Luckily the 90's came along and changed things. If the 80's had become the 90's, I would have grown up wearing snap bracelets, acid wash jeans and a Bon Jovi t-shirt. I'm getting off track...back to the game. ToeJam & Earl is the story of two aliens from the planet Funkatron. Their Rapmaster Rocket Ship crash lands on Earth after ToeJam lets Earl take the wheel. Once they reach Earth, their mission is to rebuild their ship so they can get back home. That won't be easy because there are many humans who get in their way that do whatever they can to stop the aliens. The game can be played with one or two players. 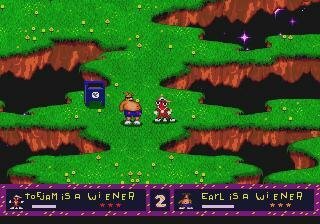 I personally preferred playing as ToeJam because he has a bit more style than Earl. The visuals and the music of ToeJam and Earl are what set it apart. The brightly coloured levels contrast with the players and the action on screen to provide a great looking game, especially considering its over 15 years old. Earth is represented as a multi-leveled planet, stacked one on top of another. The levels themselves are almost caricature's of real Earth environments. For instance, some levels are covered in pancake batter, which equates to real world quicksand. The true key to the game, however, is the music. This funk soundtrack really makes you feel like ToeJam and Earl know their stuff. It sound a lot like Herbie Hancock or George Clinton, but its not. Its just a guy who composed the music. The audio and visual combination helps make the game unforgetable. Obviously anyone would aspire to become Funklord...although Rapmaster certainly wouldn't be an insult. Personally, I have reached Honey, but never further than that. The game really wouldn't be fun if you just went level to level looking for spaceship pieces. ToeJam & Earl, like any game, has many items for the player to use. However, in this game the items take the form of presents. Collecting Bucks can help pay for certain things. You can carry only a certain amount of presents, and you don't know what each one holds until you open it. Once you do, that present is the same throughout. There are many different types of items as well. Your main weapons consist of the Action Presents. These items can be used to defend, attack, or escape your enemies. Spring Shoes give you the ability to jump long distances. Icarus Wings allow you to fly anywhere for a short time. Rocket Skates and Super Hi-Tops make you run really fast. The Rocket Skates are especially hard to control, and can only be put on while on land. Innertubes allow you to float lazily through the water sections of each level. Your main weapon for attacking is Tomatoes. You can throw them at enemies, or use the Slingshot to shoot them from further away. You also have Rosebushes at your disposal, but be careful as they can prick you too. My favorite action item would have to be the Decoy. When you open the gift, a clone of either ToeJam or Earl pops up. Enemies go right after the decoy, leaving you free to escape from danger. There are also food items, which ToeJam and Earl use to replenish health. They love to eat, and each time they eat something they react in a different way. For instance, when they eat Moldy Cheese they say "Gross!" and their health goes down. When they get Pizza or Cake or an Ice Cream Sundae they might say "Yumm" or "Wow." When you walk over food, you eat in right then and there. You sometimes may aquire presents with food in them, but it is usually random and may hurt your health. Another option for aquire help is Bucks. Money is left lying all over the place, and ToeJam & Earl put it to good use. There are Mailboxes all over the place, where you can order present from with enough money. BE CAREFUL though because sometimes the Mailbox will turn into a monster and chase you around and knock you off the edge of the level. Other humans can be interacted with for the right price. For instance, for a Buck the Wizard will restore your health. Give two Bucks to the Wiseman and he will tell you what one of your presents is without you opening it. Finally, give the Opera Singer 3 Bucks and she will pop all the bad guys on the screen. When you pay someone to fill up your lifebar, you get a rousing rendition of "Hallelujah." Other humans are just there to cause you harm. The Dentist laughs maniacally and hops after you hoping to poke you with his drill (no sexual innuendo intended). The Bogey Man is invisible and very hard to escape. There are Packs of Nerds that run you down, Moles that dig underneath you and take your presents, Tornados, Sharks, and even a Phantom Ice Cream Truck that runs you over. Cupid shoots you with arrows, rendering your ability to navigate useless. There is a Fatman with a Lawnmower who will cut you down. Chickens with Rockets come after you, as well as a Hamster in a Huge Ball. My favorite part of this game is Level 0, which you can reach through the first level. To do so, you must aquire Icarus Wings or Rocket Skates...an Innertube will work, but that is pushing it. All you do is start heading towards the bottom left corner of the level. In the game, unexplored sections of the level map are covered with blocks, which you flip to reveal the land as you go on. This enables you to see the entire level and find the elevators or ship pieces. Anyway, once you reach the utmost bottom corner, there is an island. If you jump through the hole in the middle of the island you reach Level 0. Here you can visit the lemonade stand and get your life filled up. Also, you can sit in a hot tub and converse with the Hawaiian women in bikinis. This also helps your life. The conversation consists of "Titter-Titter" and "He-He," but its a good day when you are having a lemonade in a hot tub with three belly dancers...even if it is a video game. 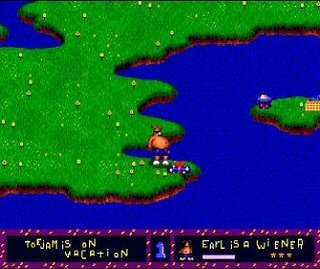 I'm reasonably sure that I am not the only person that ToeJam & Earl left a lasting impression on. The creativity that went into this game made for a memorable video game, to say the least. The fact that I am writing about it all these years later shows how I view the game. For those of you that never had a chance to play it, I'm sure you can find it on eBay or get a Sega emulator and play the rom online. It would be worth the time and minimal investment to aquire a copy of the game. Sega Genesis left us with many good games, but the only one that gets close to ToeJam as far as a creativity that sets it apart is Kid Chameleon. ToeJam and Earl had a sequel called Panic on Funkatron, but it never measured up to the original. ToeJam and Earl III came out on Xbox, and while it was closer to the original's roots, it was still lacking in comparision. So please, do yourself a favor and get a copy of the original game...trying to get off of Earth has never been so much fun. If my dad, the infamous Mike Martin, loves this game...then it MUST be good. I LOVED THIS GAME!! have you any idea were i can get a copy from now ?! thanks SO much for proving me right :) everyone thought I made this game up !